Now in its eighth year, the 2014 Preservation Awards program honors projects, individuals and organizations that have made a positive impact in preserving Nantucket’s historic character. It is our hope that the awards will continue to encourage proper preservation work, broaden outreach to the building community, and ensure the protection of the island’s historic resources. The awards recognize individuals for historic preservation related projects, stewardship of island landmarks, sensitive landscape design associated with historic buildings, historical renovations and the promotion of traditional building methods. If you know of an individual or organization that you feel qualifies for one of the following award categories, please nominate them! Be sure to include nominee’s name, location of project and how it supports preservation on the island. Deadline for nominations is Friday, March 21st at 5:00 PM. Award recipients will be notified in April and announced to the public during Preservation Month in late May. Recipients will be honored during the annual awards ceremony held on June 26th. The Historical Renovation Award recognizes the owner(s) of an historic structure, and when appropriate one or more members of building professionals who assisted in the design and completion of a sensitive new addition to a historic structure. 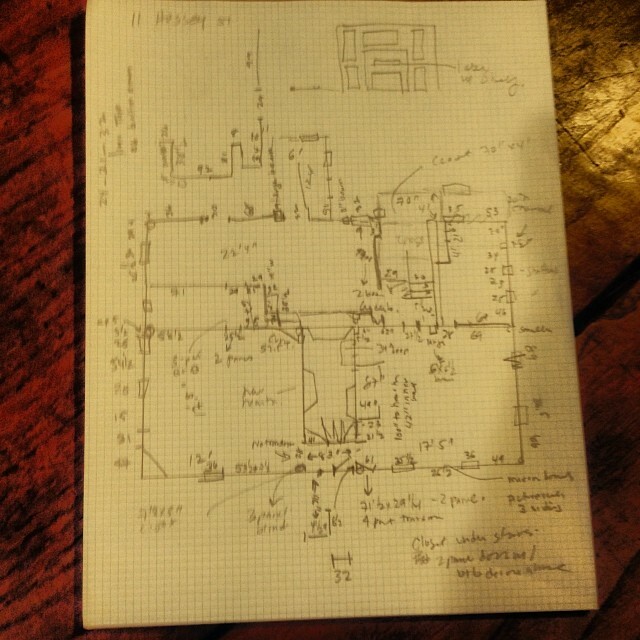 Projects should strictly adhere to the guidelines found in Building With Nantucket in Mind. The NPT Architectural Preservation Award recognizes the owner(s) of an historic structure, and when appropriate one or more members of building professionals who assisted in the completion of the preservation project. Structures may contain additions that are compatible with the historic sections and include exterior and interior work. In order to qualify for the award, preservation of those portions or features that convey the property’s historical, cultural or architectural values is required. The Caroline A. Ellis Landscape Award recognizes the owner (s) of an historic landscape, and when appropriate one or more individuals associated with the property such as landscape professionals. The award recognizes the careful stewardship or preservation of a Nantucket landscape associated with an historic structure or area, or the completion of a new design that enhances the historic fabric of the community. The John A. and Katherine Lodge Stewardship Award recognizes an individual, organization or owner(s) of historic property who demonstrate a high degree of commitment to the preservation of the structure(s) and the island. An individual who maintains an historic property or who has played an important part in the preservation of Nantucket also can be nominated for this awards. 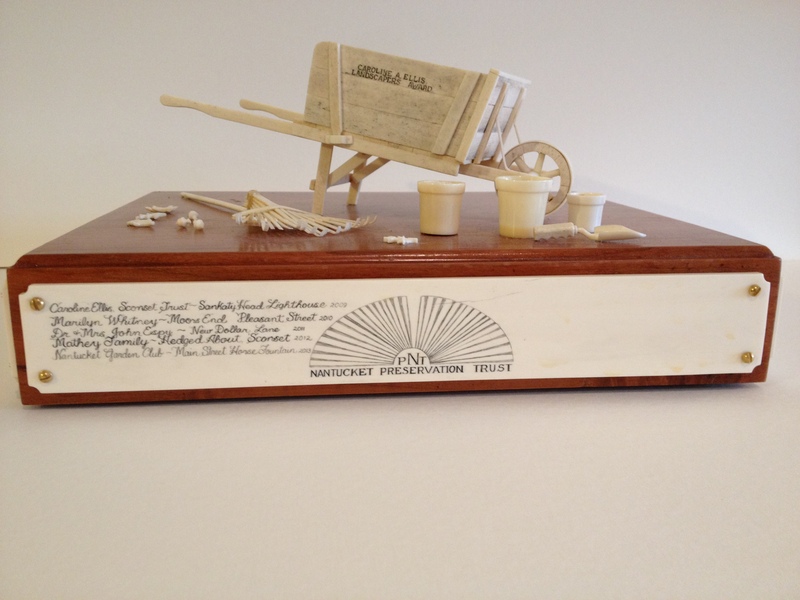 The Traditional Building Method Award recognizes craftspeople who promote traditional building methods or who have made a major contribution to the field of historic preservation on island. Recipients must demonstrate a long-time commitment to one or more traditional building methods such as plastering, carpentry, masonry using lime-mortar, or decorative painting. 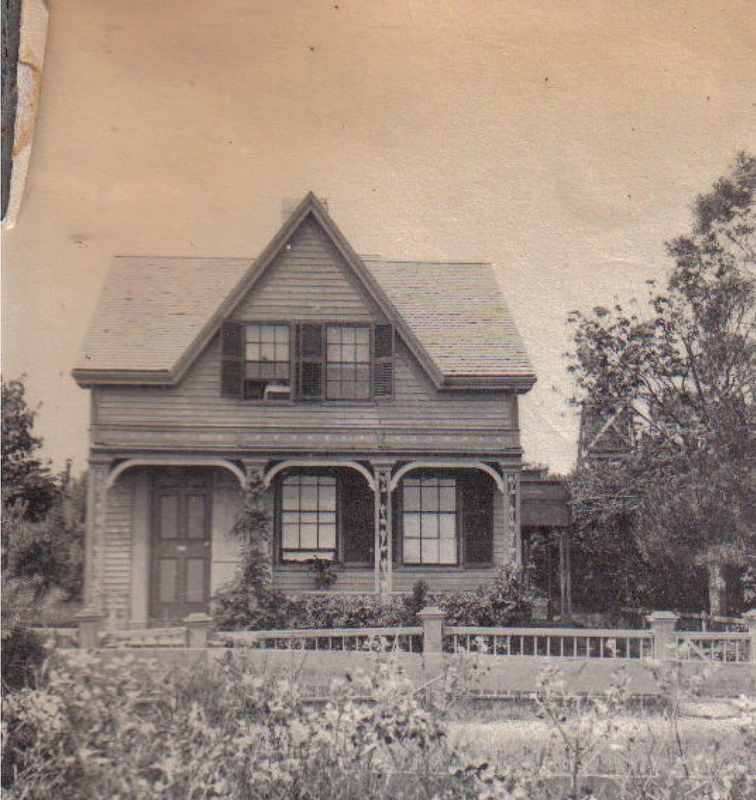 This mid-nineteenth century house, constructed circa 1835, was purchased in 1841 by Samuel King, an immigrant from Ireland who first worked as a cooper on whaling ships. In his later years, King became an avid gardener and commercial florist and created an elaborate garden around the house, which was featured in House & Garden Magazine in 1902. 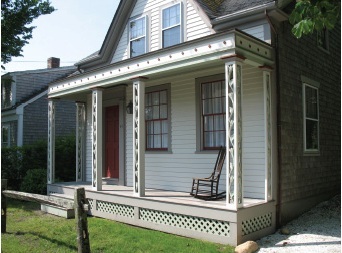 King descendants retain the property today and decided to recreate the front porch, which had been removed about 1940. Twig Perkins, contractor, and Sam Phelan and family are 2013 Preservation Award recipients of: The Tradtional Building Methods Award for the replication of 65 Pleasant Street’s nineteenth-century porch. The family used historic photographs to determine the design and hired preservation carpenter Twig Perkins to complete the elaborate decorative work. 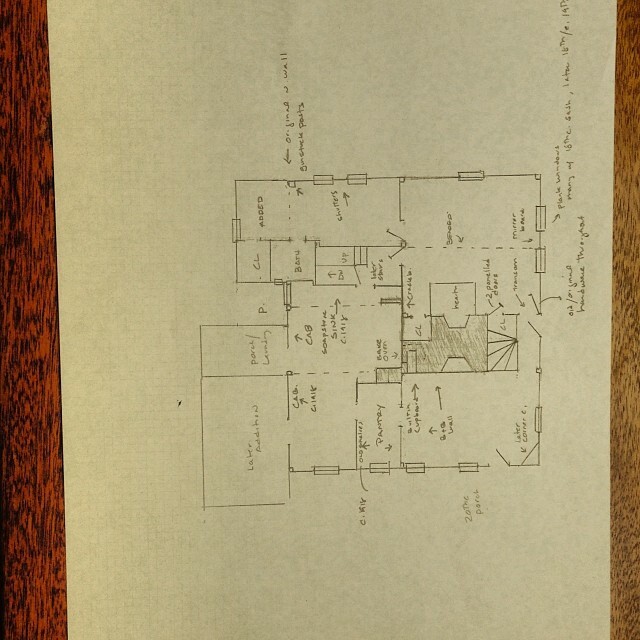 Executive Director, Michael May has recently been working on Nantucket house documentation. The documentation process, which is currently in the last stages of completion was based on an eighteenth century historic home. The process included: house visits, photographing, researching, drawing up a house floor-plan and identifying the important architectural features. 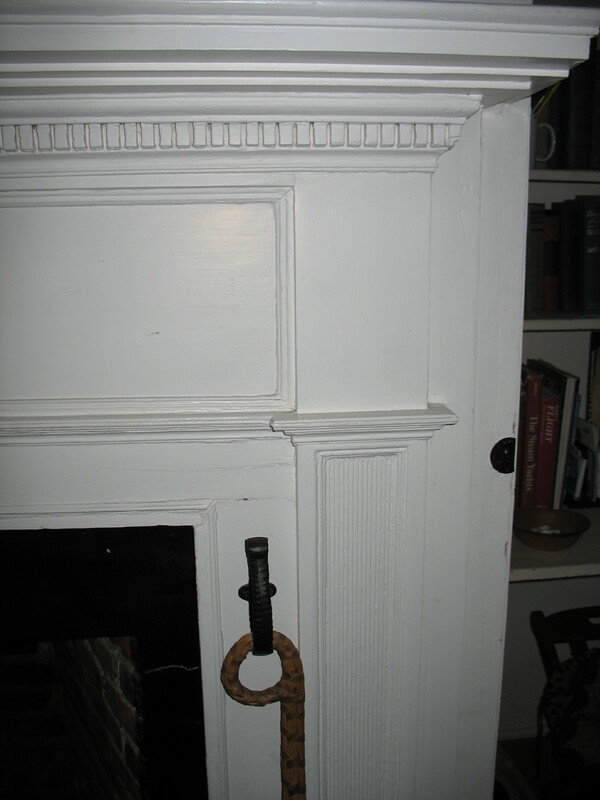 The photograph below features a detailed image of a late 18th century addition to the house, a fine Federal mantel containing a decorative dentil band and reeded pilasters. Previous Photograph’s Notes Cleaned Up! The cursory documentation will hopefully lead way into the 2014 spring 3D laser project, which Preservation Institute Nantucket (PIN) plans to undertake. For further information regarding PIN and this process CLICK HERE.